The spectacular Chunda Palace offers breathtaking views of the City Palace and the beautiful Lake Pichola. It features 2 pools, a variety of activities and luxurious rooms with hot tubs. 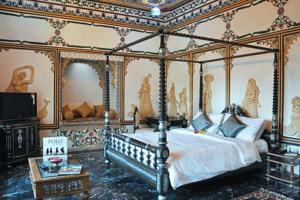 Located in Udaipur, The Chunda Palace is within 6 km from the railyway station and the city centre. Udaipur Airport is 27 km from the hotel. Featuring spacious and luxurious interiors, rooms are bright with large arched windows and hand-painted frescos. They are equipped with a flat-screen satellite TV and a safe. Palace Chunda Hotel offers yoga and meditation classes, as well as, horse riding and clay shooting. For a quiet afternoon indoors, the hotel provides Wi-Fi in the entire hotel. Enjoy a memorable dining experience at Terrace Restaurant, which boasts excellent views of the Palace of the King of Mewar and Lake Pichola. It provides an international menu for guests’ convenience. Services at The Chunda include babysitting services, dry cleaning and a tour desk. Vintage cars can also be rented for private airport transfers. Wi-fi is available in the entire hotel and costs INR 200 per hour. Free! One child under 6 years stays free of charge when using existing beds. One older child or adult is charged INR 1650 per night and person in an extra bed. Maximum capacity of extra beds in a room is 1. Any type of extra bed or child's cot/crib is upon request and needs to be confirmed by the hotel. Supplements will not be calculated automatically in the total costs and have to be paid separately in the hotel.